Ford has one of the most extensive sport utility vehicle lineups currently on the market, and regardless of your needs, you are sure to find a model that will fit them within Ford’s current SUV family. There is of course the Ford Escape, one of the Canada’s best-selling compact SUVs, and the Ford Flex and Explorer which offer multiple rows of seats when you need to accommodate more than 5 passengers and all of their luggage. And then, there is the Ford Edge, a five-seat midsize SUV that fits right in between the SUVs listed previously. 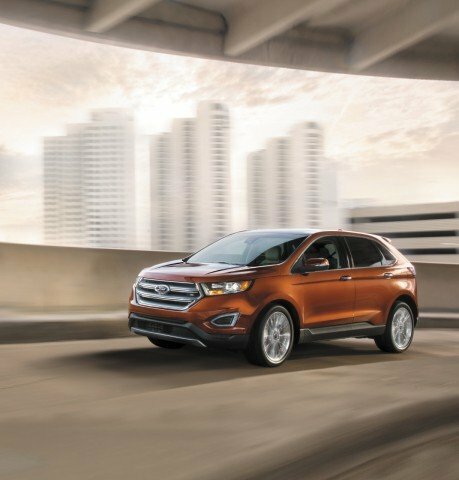 With a high-end design, plenty of features, a host of engines to choose from and tons of interior space, the 2017 Ford Edge has a lot to offer. Redesigned two years ago, the new Edge also features the latest connectivity and safety technologies. Offered starting at $32,449, the 2017 Ford Edge is powered out of the gate by a 2.0-liter, four-cylinder turbocharged EcoBoost engine that delivers 245 horsepower and 275 lb.-ft. of torque. That certainly isn’t bad for a base engine. It has an average fuel economy rating of 9.8 liters per 100 kilometers in front-wheel drive models featuring Start/Stop technology, while all-wheel drive models have a very respectable average fuel economy rating of 10.4 liters per 100 kilometers. The next engine in line is a 3.5-liter V6 engine that can send its power to the front wheels, or to all four wheels depending on the version. This engine delivers 280 horsepower and 250 lb.-ft. of torque. As with all other engines in the 2017 Ford Edge family, the V6 is paired with a six-speed automatic. The top-of-the-line engine is the 2.7-liter twin-turbocharged V6 engine that offers an impressive 315 horsepower and 350 lb.-ft. of torque. Paired exclusively with all-wheel drive, this engine has an average fuel economy rating of 13.8 liters per 100 kilometers in the city, and 9.8 liters per 100 kilometers on the highway. The 2017 Ford Edge is the perfect midsize sport utility vehicle for those who want a comfortable yet sporty ride, plenty of tech features, and a lot of interior space. Adaptive steering, Ford’s new Sync3 infotainment system, enhanced park assist which will park your Ford Edge for your, a 180-degree camera with segment-exclusive washer system, cross-traffic alert and blind spot monitoring, and lane-keep assist are all available. In terms of interior space, there is a total of 3,225 liters of passenger volume with 1,110 liters of cargo space for your luggage. Come check out the new 2017 Ford Edge today at Bruce Ford in Middleton, Nova Scotia!